When completed, the pipeline will help unlock large untapped deposits of natural gas off Myanmar's coast and carry it hundreds of miles to southern China, expanding Myanmar's role as one of Asia's important energy exporters and enhancing its influence over other countries that rely on its supplies. The project also is expected to include a port that can take deliveries of oil from the Middle East and Africa before transferring them to China. That will give China a new route for oil that bypasses the congested Strait of Malacca near Singapore, which handles a large portion of China's imported crude today. The project will likely make it harder for U.S. officials to achieve their goal of weakening the regime. The U.S. and Europe imposed tough sanctions on Myanmar after its ruling junta ignored a 1990 national election won by supporters of opposition leader Aung San Suu Kyi, who remains under house arrest. 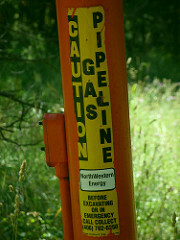 The other big natural-gas story is Russia, which is planning two new pipelines to Europe in order to cement its role as the continent's main energy supplier—something that generates a fair bit of unease within the EU, given Russia's unpleasant habit of shutting off gas to countries it has political disputes with. But meanwhile, the Financial Times reports today that the ongoing boom in U.S. shale gas production has meant, at least for now, that Europe hasn't needed to rely quite so heavily on Russia's Gazprom for its gas imports, which is upending various long-term contracts and creating all sorts of disputes. Worth following.